Home // Uncategorized // Audiences hear your words, but they see your body. 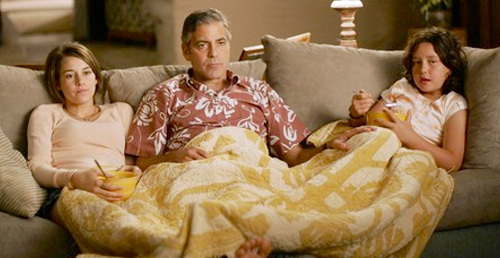 If you saw “The Descendants” film, you almost certainly remember the closing scene, where George Clooney’s character and his daughters sit silently on the couch, passing ice cream back and forth. In that moment, not a word was spoken, but everything was said. Alexander Payne, the film’s director, often uses those types of visual devices to convey thoughts and emotions. “The gestures and facial expressions that actors use combine to tell the story visually, along with the dialogue,” Payne said to the International Cinematographers Guild. He points out that Warner Brothers judged its cartoons by seeing if sample audiences could tell what was going on without the sound. How about you? When you’re presenting to an audience — or just conveying your ideas and opinions to a few people — are you aware of your facial expressions, body language and hand gestures? Are those visual elements distracting from your message — or are they supporting and enhancing what you’re saying? Start paying attention to how communicators you admire — speakers, actors, politicians, ministers and others — effectively use their faces, bodies and hands to benefit their messages. They know the power of verbal and visual partnerships. When I’m coaching a client on presentation skills, I’ll sometimes ask him or her to first give me one delivery of the content while sitting in a chair, remaining as motionless and expressionless as possible. This total absence of all body language makes the person acutely aware of the importance of blending appropriate gestures and expressions with what they’re saying. As you prepare for your next presentation, plan out how gestures and facial expressions can assist your words. Then, as you rehearse, watch yourself in a mirror or on video. Or, better yet, give your presentation a trial run for friends, family or co-workers, asking them to provide honest feedback on your body language. Don’t become self-conscious, but do become self-aware. Recognize how expressions and movements can work for you and your words.